It’s not the first Midwest city to require benchmarking, but it is the largest. 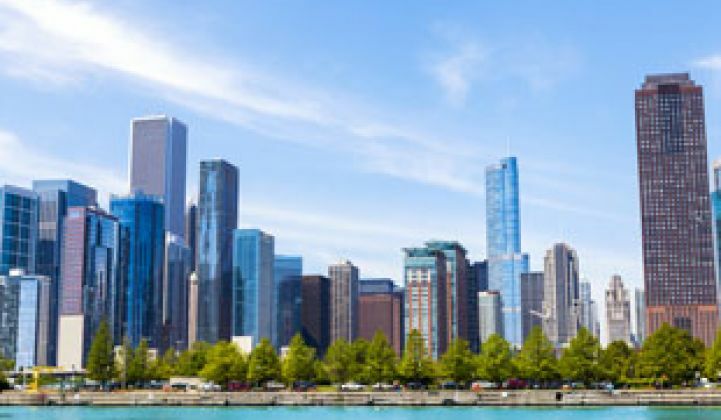 Chicago has become the latest city to require energy benchmarking of large buildings. The city has a goal of cutting the energy use in half of Chicago’s buildings by 30 percent by 2020. To help move toward that goal, the Chicago City Council voted 32-17 on Wednesday to adopt the Chicago Energy Use Benchmarking Ordinance, which will require buildings over 50,000 square feet to track their energy consumption. Though some opponents have decried the move to disclose the scores as public shaming, benchmarking is gaining steam across large cities and some states, including Washington, D.C., New York, Seattle and California. At the municipal level, New York City and Minneapolis also require public disclosure. The idea that older buildings will be punished in the town square, however, has not borne out in other cities. Public benchmarking opens up a database of scores that can be used to better target utility programs, or could possibly be used to secure funds from Chicago’s Infrastructure Trust. Also, studies have found that benchmarking saves about 7 percent of energy use for buildings that obtain an EPA Energy Star score, which is the measurement used by all U.S. benchmarking programs. Benchmarking does not magically make money appear for retrofits, but for older buildings, it can help make the business case for targeted retrofits, and if nothing else, it can help pinpoint wasted energy, such as lights or heating systems left on 24 hours a day. There are also lots of low- or no-cost software tools to help building owners and managers find low-hanging fruit to save energy. There are only about 3,500 buildings that will be affected by the new law, but they account for more than 20 percent of the city’s total building energy consumption, according to the Chicago Tribune. The question now is who will be next. Minneapolis brought benchmarking to the Midwest, and now the third-largest city in the nation has adopted it. Austin led the charge in Texas, but other large cities in the Lone Star State have yet to jump on the bandwagon. And only two states have benchmarking laws, California and Washington, which leaves another 48 to go. Some municipalities, such as Washington, D.C., are eager to look beyond their own city limits and challenge others. C40 cities, consider yourselves warned.